It seems right that my first book of the year was a comedic memoir. That’s a genre I really enjoy. It’s even better that it’s the work of Jenny Lawson whose first book I adored. It’s a joy to revisit an author I’ve enjoyed so much before and help light up a gloomy January. Lawson’s sense of humor is amazing. She has a way of poking fun at her illness while still recognizing how serious it is and how much care she needs to take to make sure she stays healthy. She has advice that you can follow with or without depression: live life to the fullest when you can. And when you can’t, enjoy cat rodeos or spending time with your family or whatever you do have the energy to enjoy. And if you can’t, it’s OK. You’re not alone. Sometimes I wonder how Victor lives with Jenny. The way she describes herself in her book can’t be her 24/7. I’m sure there are periods of downtime. He and Jenny are the only two described in detail and I think they’re both very real. Victor loves his wife but recognizes her bouts of unusual behavior or her comical way of dealing with her mental illness. Jenny has found ways to cope with difficult situations she’d rather not be in and make herself and others laugh. I think that if I met either in person, they would probably act a lot like their portrayals in the book. I adore Victor. He’s so supportive and loves Jenny when she’s at her lows. He recognizes how she’s coping and when she’s doing it well and when he needs to help. I think my husband is very supportive when I have a rough spot and I saw a lot of him in Victor. So it was hard not to love him. I’ve never been diagnosed with a mental illness but there are sometimes I wonder if we all suffer from one or more to some degree. I’ll have moments of anxiety that feel very similar to the way Lawson described her anxiety. The difference is that mine isn’t crippling and are fleeting, unlike Lawson’s. It was reassuring to hear that someone else gets the same feelings I do and that if it ever started affecting my life in any way, there are treatment options. Though it also sounds like my solution of ‘let yourself stay home and snuggle on the couch with your hubby and watch Nailed It’ would probably help Lawson, too. I enjoyed hearing about Lawson’s trip to Australia. I thought that would be a trigger for some of her illnesses but she used it as a chance to be Furiously Happy and enjoyed herself to no end. It was a great example of what she meant by being furiously happy and it was great to see her live that. I flipped through my physical book so I could see the images and got to laugh at them a second time. There wasn’t a particular part of this book I didn’t enjoy. I would have liked slightly more cohesiveness, but I don’t think you can really ask for that when someone’s book is made of their blog posts. Some of the previously unpublished material helped weave a single narrative, but this book still suffered from being a bit disjointed and with no discernible timeline. Oh well. Lawson narrated the audiobook which I thoroughly enjoyed. Her sarcasm and wit were great. Sometimes, when the author narrates, there are a lot of times when the sound engineer just couldn’t do enough to make the whole story sound good. Often, there is uneven pacing or inconsistent sound levels. Lawson had no such problems and I would listen to her narrate other books in a heartbeat. She may have another job doing this going forward, it was quite remarkable. Lawson is helping to shine a light on mental illness: to remove the taboo and get people talking. I think she does an amazing job at this. She mixes serious comments and reflections on mental illness with her sense of humor and makes people come back to hear more. She embraces those that may have been marginalized and helps them find a group of like-minded people. That community can help those who need it and encourage them to seek out the help they may need. Writer’s Takeaway: Combining humor into writing is always wonderful. It may not always be appropriate, but it can help lighten a very dark topic at a time where it may be very necessary. I love how Lawson did this and how she broached a very serious topic with light-heartedness and grace. I’ll read her next book in a heartbeat. I adored this book and Lawson’s wit. Four out of Five Stars. This book fulfilled the 2000-Present Time Period for the When Are You Reading? 2019 Challenge. I read her first book and loved it. I can’t wait to get a copy of this to read as well. If you liked the first one, I think you’ll enjoy this as well. Happy reading! I’ve read both her books and enjoyed them both – think this one more. She made me really laugh out loud in several places. I can’t remember the first one as well so it’s hard to pick a favorite. I think the first one? Probably because I read her blog periodically so I knew one or two of these stories already. Happy reading! Thanks! Fantastic book. Happy reading! Great review. I loved this book and was in hysterics. I myself have anxiety and my fiancé has both so this book was on point for me. I have been trying to get him to read it, but that will take some work. I can’t wait to reread this for book club since it’s the pick in March. I think I may listen to the audiobook because I am sure it will be even funnier. I highly recommend the audio. Hearing Lawson tell her stories is incredible. And what a great way to revisit the book. Have a great discussion. Happy reading! This book was amazing. 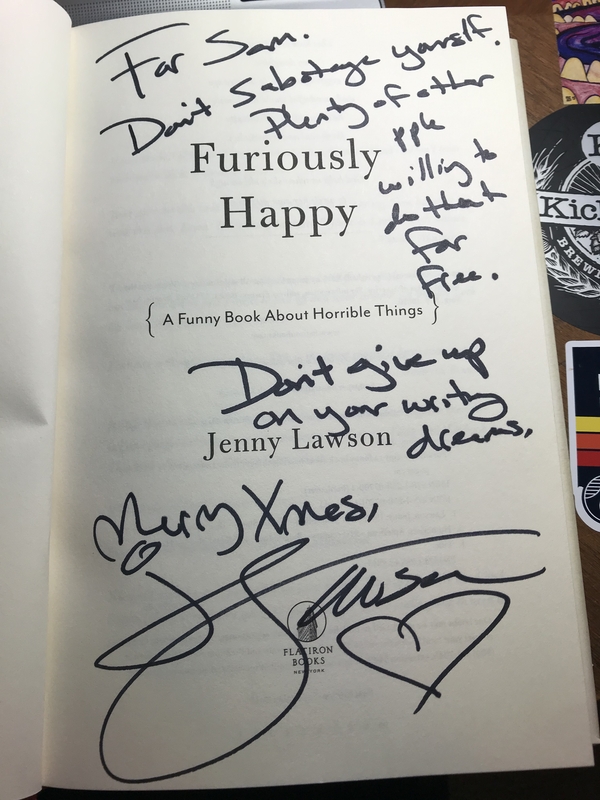 I absolutely love Jenny and how she made me feel better about my own battles with mental illness, in a way that I had never felt before. A good friend loaned me the book at a time when I really needed to read it, and it was perfect. So glad that you read it and enjoyed it! I’m glad you enjoyed it and benefited from it. It’s wonderful to hear how much she helps. Happy reading! I loved this book. I’m not one who readily laughs out loud, but this had me giggling helplessly. Not once or twice, but a LOT. And I’m mentally ill, too, so this book was a wonderful vacation for me from having to deal with stuff I don’t have enough spoons for. I never encountered anyone who thinks in tangential, progressively absurd streams of consciousness before, JUST LIME ME!! do not drink water while reading. you will laugh out loud and wake people up and/or (probably both) spit out your water onto your kindle! happened to me. just a warning! So glad it resonated with you! It was fun having Jenny make me crack up while I was running. It made me really concentrate! Have you read her other book? Happy reading!